Address: 3 High Street, Hadleigh. Bertram Henry Wallis was not from Hadleigh. His connection to Hadleigh is through marriage. In April 1916 he married Margaret Ellen Payne, daughter of John H. Payne, the boot and furniture dealer of 3/5 High Street. Bertram was born Albert Henry Wallis in Elmstead, Essex 1890, the son of a policeman. He found employment as bank clerk, but on 27 August 1914 enlisted at Chelmsford as a private with the Army Service Corps and used ‘Bertrum’ as his forename. He clearly showed a lot of potential and quickly advanced through the ranks, becoming a Company Quarter Master Sergeant in just under two months. On 5 May 1915 he received a commission and on 29 May 1915 was sent to France where he worked in various supply depots. 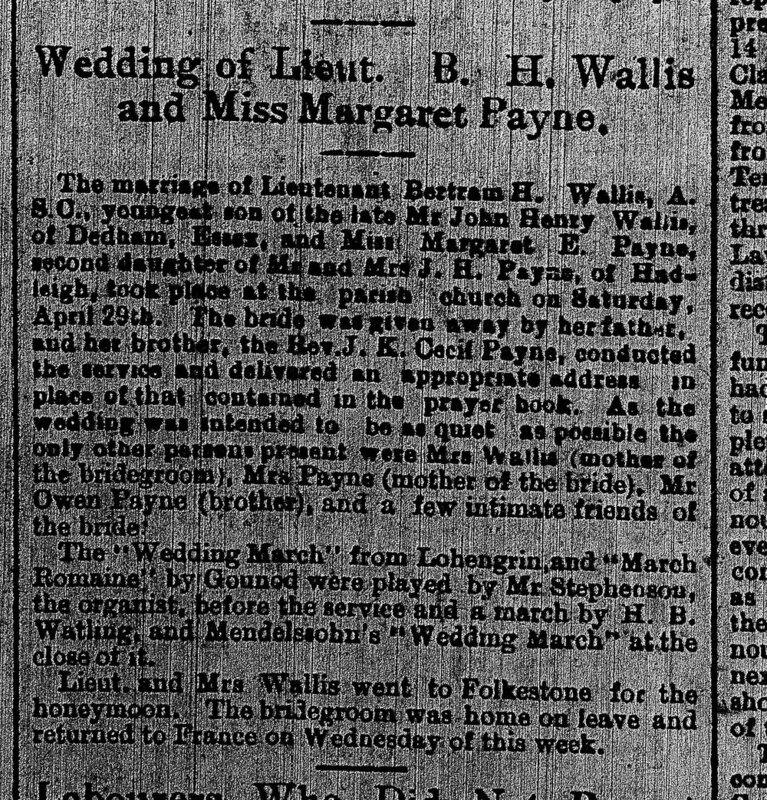 He clearly managed to get some home leave in 1916 when he returned to Hadleigh to marry Margaret in a quiet ceremony in Hadleigh on Saturday 29 April 1916. 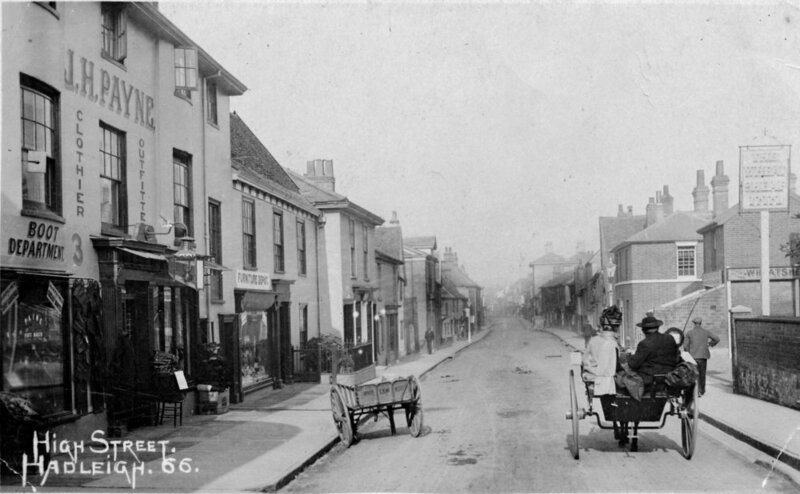 Following the wedding, the couple went to Folkestone for a short on honeymoon, before Bertram returned to France on Wednesday 3 May 1916. He continued to work at Base Depots, in supply units until 7 September 1917. In October 1917 he was sent to the No 1. School of Instruction at Brocton Camp, Staffordshire. Where he must have undergone some infantry tactical training. On the 10 November 1917 he was promoted to Captain. He was sent back to France, arriving Le Harve 0n 19 April 1918. He underwent some more training before being sent to join the 1/1st Cambridgeshire Regiment on 22 June 1918. Although the battalion war diary records that he was taken on strength on 20 July 1918. At the end of July 1918 the 1/1st Cambs Regt were preparing for the Battle of Amien which would begin on the 8 August 1918. This would be the start of the 100 day offensive that would see the Allies defeat the Imperial German Army and force the armistice. For this Wallis was later awarded the Military Cross. He remained at the heart of the action throughout the drive towards the east. On 18 September the war diary records, “Battalion attacked. Heavy mist and rain difficult to maintain direction. All companies met with stiff opposition. Epehy was garrisoned by troops of Bavarian Alpine Corps who offered strenuous resistance.” In this action Captain Bertrum Henry Wallis was shot through the heart and died instantly. The day after he was killed in September the Battalion had made progress and his body was recovered and buried at Epehy Wood Farm Cemetery, west of Peronne. He is remembered on the Dedham and the Hadleigh war memorials. Interestingly, his name is recorded as Bertram H. Wallis on the Hadleigh memorial and Albert Henry Wallis on the memorial at Dedham. We hope that this page has been able to tell the story of Bertram Henry Wallis. If you know of any information which might help to add to the story then please get in touch.